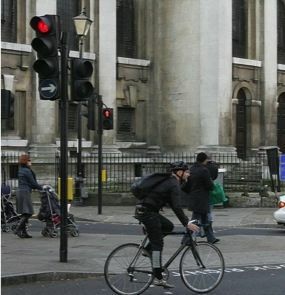 Perhaps one of the biggest complaints from motorists about cyclists is their tendency to ignore red lights. Cyclists who do this are in the minority, however, there are obvious rules of the road that are being ignored when a cyclist jumps a red light. (b) of another character authorised by the Secretary of State under the provisions in that behalf of the Road Traffic Regulation Act 1984, has been lawfully placed on or near a road, a person driving or propelling a vehicle who fails to comply with the indication given by the sign is guilty of an offence” The best advice to give is simply not to do it. Skipping red lights not only puts other people's lives in danger, but it also puts you, as a vulnerable road user, at extreme risk.